We all realize there is more than one way to do things and this thread is a history of how I am doing things. This is not my first fiberglass RV renovation. I thought I would document my fixer upper Campster renovation here since I bought it from one of the forum members and other members have asked me to post my restoration progress. The project will be ongoing for a little while. I bought my Campster knowing it needed a lot of work but fortunately I do have the skills and knowledge needed to bring it happily into the 21st century. I am a former aircraft mechanic and have worked with fiberglass as well as metals and all kinds of adhesives and materials. I am also a wood worker and have done metal fabrication too. Plus I can do wiring, plumbing and even upholstery. I have also renovated several houses over the years. Lets start with some before photos. Above is the before photo of the right side. I will be painting the exterior to coordinate with my Honda Element tow vehicle which is red with the black lower trim colors on the bumper and plastic panels. Fortunately Epifanes marine enamel paint has a great color match to the red and Rustoleum bumper and trim paint matches the black. The car and trailer will look like they were made for each other! The Epifanes primer will go on first. But there is a lot of prep work to be done before painting. Where to start with the major prep work? I have some minor fiberglass work to do here and there. We always have epoxy resin and fiberglass cloth on hand because working on boats and other objects is part of our life style. So I will briefly be showing some of those repairs in this thread. Remember I am not asking anyone how to repair the problems. I already have done these types of thing before on another RV I own. The first of the bigger repairs I need to make before I get onto the painting is to repair some damage in the plywood floor that occurred near the doorway. I need to remove the door and frame to do this task and since I have to remove those to paint this is where I will begin the renovation. Over the years the door frame at the bottom has pulled down leaving gaps at the corners where the sides meet the bottom. It is going to need some shimming and some new L brackets as well as new butyl tape under the framing. For some reason a previous owner drilled a few holes in the upright flange of the lower threshold. This appears to be one source of the water coming that occurred in combination with new door gasket material needed and a gap at the top corner of the door. Getting doors to line up square with frames with even gaps was never my favorite task but at least I know I can make it happen...after some blue words of course. Cute little camper. I look forward to following the progress on your project. Sounds like you have the skills to make it happen. I too, have a 71 Campster and I am very much interested in Everything you do to it. Looking forward to read more. Today I was removing cabinetry and trim around and near the entry door so I can begin repairs around the door frame and to the floor at the entry. I also took off the aluminum rain drip cap that was above the door as well as all the screws that were holding the door trim in place. 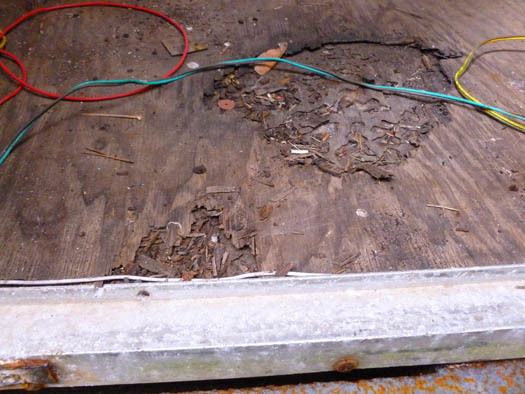 This lead to the discovery of yet more causes contributing to having some rot on the plywood floor. Yes I am using the plural, it was not leaking from just one source it was multiple sources contributing to the problem. When I pulled the rain cap off I discovered the fiberglass shell is cracked diagonally into the upper left corner of the door area see photo above. I will have to add layers of resin and tape on the inside and outside to reinforce that area. As you can see I will have a lot of holes to fill in as part of the repair. A new rain cap will be purchased but installed with 3M VHB tape and no screws near those weak corners that like to have cracks run out from them. 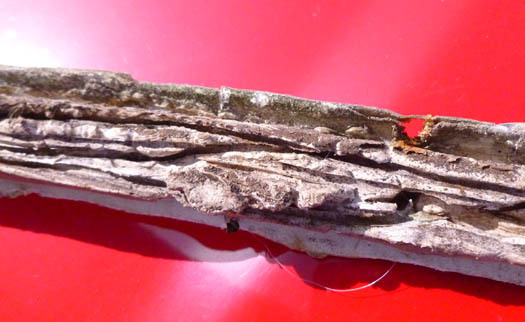 The second issue (shown in the photo above) is also a major one that was created by the Trails West employee who trimmed the shell to create the door opening. They cut the opening a little too tall. 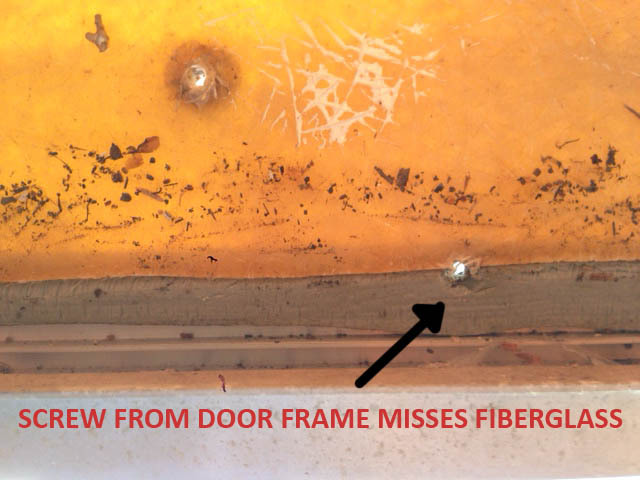 When the door jamb was installed the upper aluminum jamb extrusion only overlapped the fiberglass by a scant 1/4". The putty tape is not getting enough coverage area to keep it sealed up tight as nothing is pulling the fiberglass shell tight against the jamb. You can see the putty tape in the photo, it is just sitting there exposed and it is mostly not even in between any materials. The rain cap was having to do the work of keeping out the water but it too was damaged and no longer sealed properly. I am going to have to add some additional fiberglass material along the top of the door opening. I am removing and not reusing the original one piece fiberglass kitchen surround so I can cut some of it and use it to extend that upper area. It is going to be handy patching material for filling in other unwanted openings such as the old electrical panel inlet. Now for the problematic threshold. The photos below are what was under the aluminum extrusion to support it. Vinyl flooring was under there forming the support. They covered it on the backside with big beads of construction adhesive sitting on top of the fiberglass bottom of the shell. This is not something done by a previous owner, this is the factory install job. When I removed the threshold there was a hidden surprise. Under the threshold was a piece of the old vinyl flooring it spanned over a gap of an inch or so with the fiberglass shell as the bottom curving up just slightly at the outside edge. They ran 12 volt wires through that gap. They squirted construction adhesive in the gap to provide support for the vinyl flooring and the aluminum threshold. Then they ran screws through the aluminum threshold on into that gap. 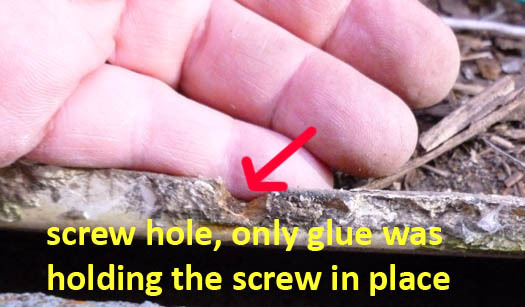 The screws missed going into the fiberglass which meant the construction adhesive was the only thing holding those screws in place. 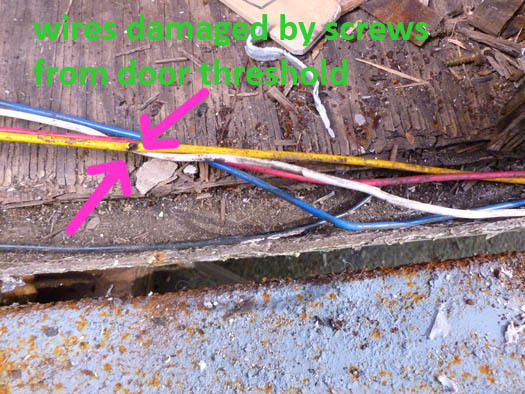 The screws cut through the sheathing on the wires in various places exposing the copper strands. Didn't someone just talk about a "hot skin", well there is a good source for how it could happen. Fortunately those wires were no longer in use. What a mess, no wonder the treshold was sitting crooked, leaking and coming apart from the rest of the door frame. Remember this photo below of the lower corner with the big gap? Now we know why it looked that way and why they had to add corner angles to try and support it. I will be thickening some epoxy resin with wood flour and glass fibers and filling that mixture into the gap between the shell and the plywood at the doorway thereby building up a solid base for the threshold that won't rot and it will grip screws nicely. It will no longer be used as a wire chase. I will show that threshold building task later in this thread since it is going to take a while to get the doorway rebuild done. The other thing I will be doing after fixing the above issues is adding some wood to create an inner frame around the door opening, it too will get fiber glassed in. The doorway really needs that strength as the shell is simply too floppy in that area which is the cause of the corners of the jamb frame coming apart from each other which of course creates more leaks. 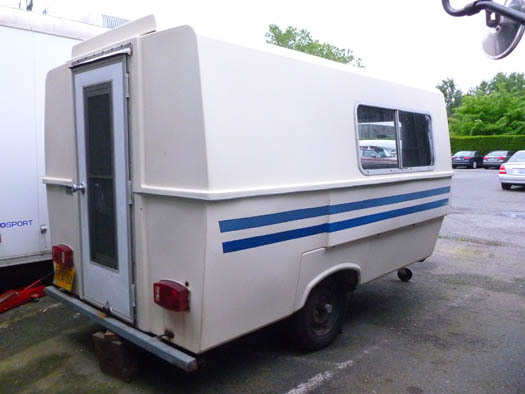 While the Campster is a fun little trailer it was "built to cost". Each of these tasks takes a while but none is truly difficult. My break time is over, back at it, I still have that kitchen cabinet to get removed so I can get to the backside of the door threshold. I had to wait for my friend to arrive as it would be a struggle to pull it out on my own. He had to help me remove the door as well as it is heavy and I did not want to risk breaking the glass or bending the door jambs. No doubt you wouldn't use it but then again I already some on hand so I will use it . We always have some VHB around in the workshop for use on industrial projects. I don't live "normal" like most people, I live in a maker space with a product designer/automated machine designer/boat builder. We have Laser cutters, 3D printer, CNC machines, vinyl cutter, all the standard wood working tools, metal lathe, milling machines and lots more plus lots of great adhesives, fiberglass resins with pump dispensers, buckets full of wires, test equipment, automated machinery parts, shelves and drawers full of metal, wood, plastics and fasteners of many kinds. I am in a small waterfront industrial mixed with residential neighborhood where I have access to all kinds of great supplies. There is a West Marine store right outside the door. I am definetly not your average 66 year old woman, I started building jet aircraft for Boeing in my 20s and was a lead mechanic there. Oh and I do know how to remove VHB tape if needed. You can learn how to do that on youtube . Holy Moly! I'm totally in awe!! Hope I don't have THOSE kind of issues! 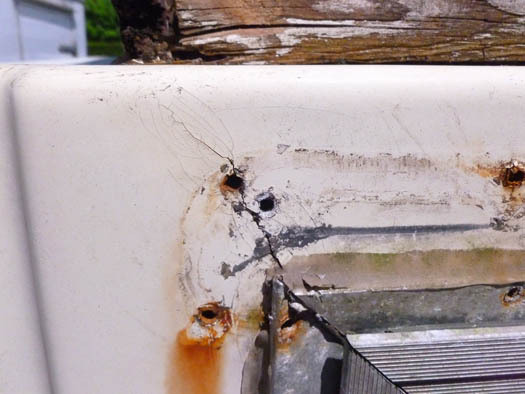 There is no predicting what you might come across in RVs. Tip for removing VHB tape. It grips very well to surfaces but removes very cleanly without needing any chemicals and without leaving any residue. How you remove it is different than other more familiar tapes. In fact you might have already been using one of the VHB tape products without realizing what it was. You know those 3M Command pull to release mounting strips that can be used to mount pictures, bins and on the walls so you can remove them without damage to the walls? You have probably seen TV ads for this. There is a little tab at the end that projects beyond the object you mounted and you just pull the tab stretching the tape parallel to the wall so that it releases cleanly from the wall? That is the trick to taking off VHB tape, just tease up enough of the VHB tape at the end so you grab it with pliers and start stretching keeping it as parallel to the surface as you can. If you want to mount something but think you might want to take it off later then leave a little bit of the tape projecting out from the edge of object you are mounting so that you can grab onto it. For mounting objects VHB tape comes in many thickness and strengths. On the thicker tapes there is a foam layer in the center. If you take a long, thin, sharp blade you can cut through the foam in the middle to remove the object you have mounted. 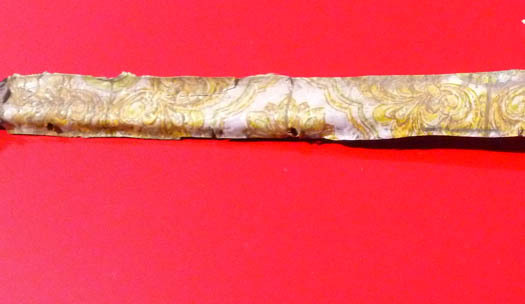 Then you tease up the ends of the tape left on the objects and do the pull and stretch technique. So what kind of blade is going to get in there and cut that foam layer in the center of the thick VHB tape? I use a "tissue blade". They are easy to find at the craft stores where they are sold for slicing polymer clay. Here is an example of one for sale on the internet. I use it for other things too so I already have this tool on hand. So don't be afraid to use VHB tape just because you think it will be impossible to remove at some point in the future. Progress, the old interior has gone into the dumpster. Of all the stuff in it there was only one original light fixture with an intact curved shade that was worth salvaging. Well that is not totally accurate I have hung onto the poptop fabric for now as I need to measure it and make a pattern from it. It think going to Seattle Fabrics tomorrow and getting some red fabric to remake the popup will be my reward for my completing this first phase of the renovation . Of course even when I am not physically working on the project I am still working on it gathering supplies and brainstorming how I am going to reconstruct it. One chore I am not looking forward to is replacing all the bolts that go from the interior and through the frame. They are ALL badly rusted as are the brackets that were used for anchoring the cabinet fronts in place. We did purchase a nut splitter which will help with some them. The framing that is just on each side of the door that the kitchen cabinets tied into and supported the cabinet shelves was a real bear to remove as the bolts had to be severed from inside the interior. Thank goodness for Dremel cut off disc,they have gotten me out of tough spots more times than I can count. They could not be budge with an impact driver except for one bolt that sheared off just under the head from that effort. 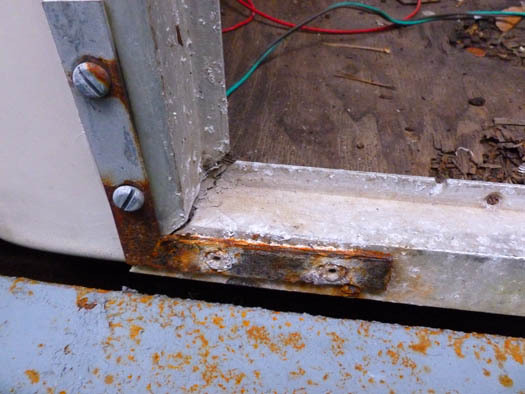 Too much moisture in that area by the door for too many years so that even soaking with a rusty bolt removal solution for several days did not yield any results. K C, thanks for the info for removing VHB tape. Didn't see any of that on the 3M site. Yes! Thank you for the great info 'how to remove VHB tape'! Fascinating. Really like your narration. I'm learning! I didn't save my poptop fabric and then regretted it- if you end up with measurements or a pattern on paper please let me know. I made a top (also after a trip to Seattle Fabrics) but am not yet good with it. If I end up starting all over I'll do it with a pattern. Are you going to replicate the interior or change things around?